I went on vacation to get away from it all and I certainly have. I've also had plenty of time to think about what I'm doing and why, and it's occurred to me that touring by bike, especially alone, is a unique experience, and the way that experience feels depends mostly on how populated the route is. I deliberately chose a route that went through some of the most remote geography that I could find, up to the limits of my gear and carrying capacity. I wanted to get out into the middle of nowhere, and encounter as few people as possible on the way. 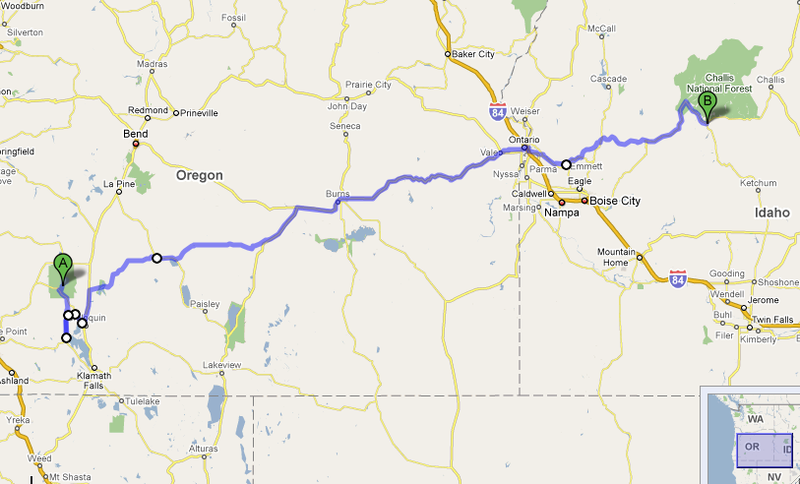 I tried to make a route like that through California, but all the sparsely populated parts of California are sparse for good reasons. They are all either too steep, too dangerous, or unpaved. 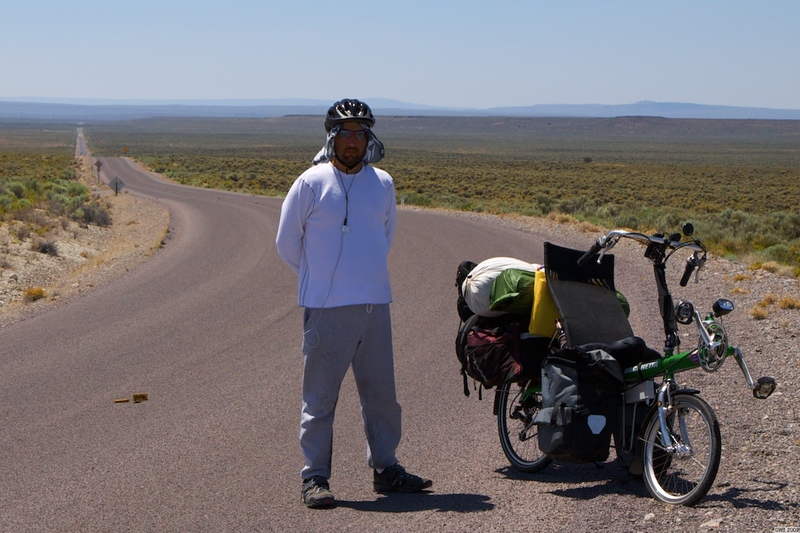 One of the reasons I settled on Oregon - the eastern portions especially - was because it appeared to be the flattest and also some of the most remote territory I could find without having to deal with transporting a recumbent bike on the train system. But the flatness part turned out to be inaccurate. I've spent eight hours on the bike most days, and probably almost half of that time toiling slowly up hills steep enough to require first gear. Part of the problem is that I didn't survey the area I would be biking through with my own two eyes, and instead I relied on Google Earth, which reports height data correctly but only to a certain granularity. It smoothed the hills right out of most of the terrain I examined. The other problem is that I thought I would be able to go up shallow hills with no trouble at all, but I underestimated the drag that all of this hardware creates on the bike. Unfortunately, there wasn't anything I could do about it. I went through my packing list many times, and aside from one pair of ski gloves and a couple of pairs of shorts, there wasn't anything that I could have left out. I had to carry at least this much weight if I wanted to camp, and I had to be able to camp if I was going to travel through wilderness. Speaking of camping, I've very much enjoyed the seven days that I was able to camp. The sites have been lovely. The gear has worked well, too. The tent is easy to set up, the sleeping bag is warm and roomy enough, and the mattress is easy to deploy. But the tent, bag, and mattress are very large items. They occupy the whole back half of the bicycle, with just a little space remaining for laundry and a spare tire. Combined, they also weigh more than everything else I brought, so I'm riding with at least double my usual weight. The consequence of this is that I spend a long time crawling up hills that I am interested in for significantly less time than it takes to climb them. It's also a problem when I'm going down the only paved road, and roads that branch off it may lead to interesting things, but they're all gravel or dirt and would be brutal on my tires. So I'm very disinclined to actually explore these side roads, and I just keep trucking along instead. But seriously, I should have expected this, because I am deliberately biking through desert, and during the hottest time of year, and I'm doing it during a time when the UV exposure is bad enough for the weather service to publish a health alert about it. I budgeted 30 miles a day maximum for most days, and it turns out that even with all these hills in the way I can actually pedal the bike for a full eight hours, and take myself fifty miles or more, provided I take time to stretch, and lie flat on the ground every once in a while. Of course I have to be careful lying on the ground because every time a car comes by the driver gets worried that I have passed out in the heat. So, in practice, I can lay down for about ten minutes average, and then when I hear a car approaching, I have to get up and act like I'm rearranging my luggage, because if I don't, they'll stop and I'll feel bad for making them stop and they'll feel silly for stopping, and yadda yadda. One time I was just leaning against the wheel and didn't bother getting up, and sure enough the car stopped. I had to thank and compliment them for stopping. The last thing I want to do is erode their willingness to help, since it might save my life one day.